Is it a sign of the high value corporate types place on their BlackBerry devices, or of RIM continuing to be out of touch with the smartphone marketplace? T-Mobile has announced that it will be launching the BlackBerry Bold 9900 smartphone on August 31: the device is at the high end of RIM’s latest offerings, sporting a speedy processor, BlackBerry OS 7, 24-bit graphics, and speedy mobile broadband on T-Mobile’s “4G” HSPA+ network. It will also come with a high price tag: although T-Mobile hasn’t officially announced prices, the BlackBerry Bold 9900 will be offered for $299.99 with a new two-year service contract after a $50 mail-in rebate. That means eager BlackBerry fans will be spending close to $400 (with taxes, fees, and other charges) to put on of these in their pockets. The BlackBerry Bold 990 features RIM’s latest BlackBerry OS 7 with improved HTML5 Web browsing performance, a 1.2 GHz processor, and like other handsets in RIM’s latest lineup features both a touchscreen and a QWERTY keypad for messaging—it can also handle HD video capture via its 5 megapixel camera. Like other new BlackBerry offerings, the 9900 offers RIM’s new 24-bit Liquid Graphics interface for a smoother look, along with support for augmented reality applications. Folks used to RIM’s standby features will appreciate built-in email and BMM clients, along with an updated Social Feeds app for keeping on top of social networking. The 990 features GPS, 802.11b/g/n Wi-Fi, Bluetooth, and 8 GB of internal flash storage. For BlackBerry aficionados, the BlackBerry Bold 9900 represents an evolutionary improvement over previous BlackBerry models—and if you have to carry a BlackBerry to tap into corporate email systems, it may represent a solid choice. However, feature-wise there may not be much to tempt users away from less-expensive Android or iOS devices, save perhaps in the case where a physical QWERTY keypad—and RIM has historically made most of the best—is a make-or-break feature. 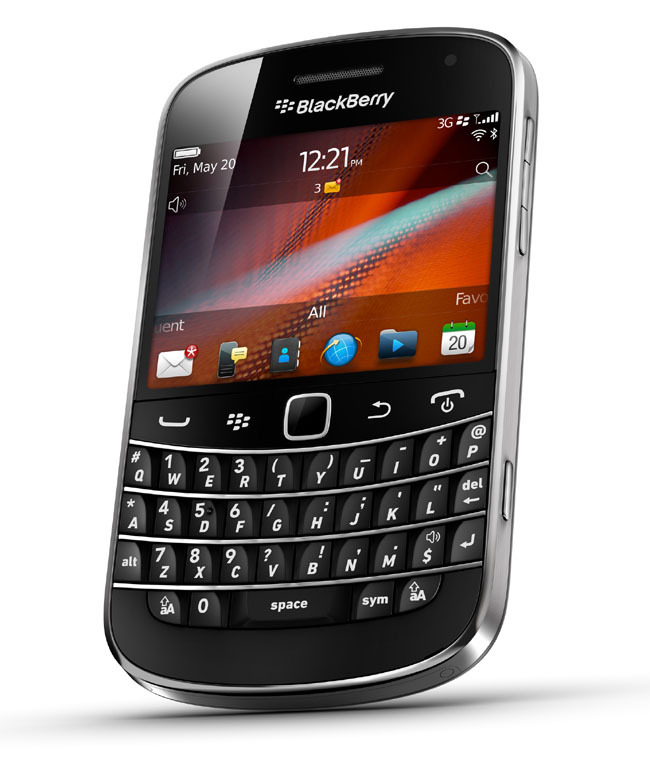 Business customers can place pre-orders for the BlackBerry Bold 9900 now.